With the Holland Travel Ticket, Discover the best of the Netherlands in a day. Simply choose between peak and off-peak travel. 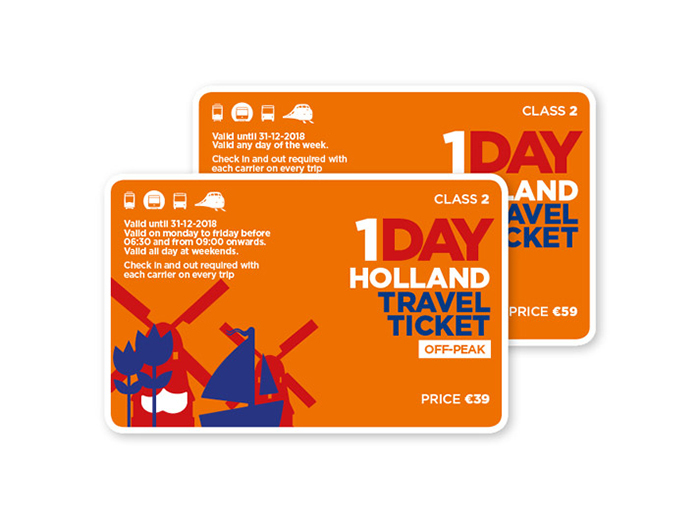 With each ticket you can travel in all trains, buses, trams, metros and ferries in The Netherlands. 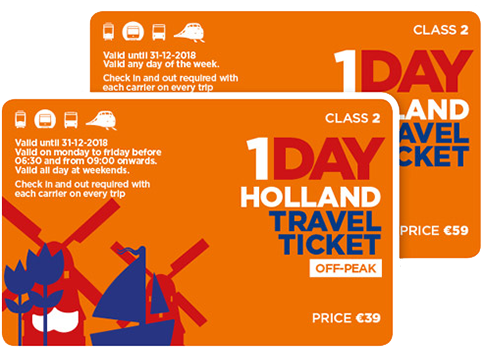 The Peak Travel Ticket grants you access for only € 61 to an unlimited number of public transport rides throughout the Netherlands within a calendar day. If you won't be travelling at peak times, opt for the off-peak ticket. For only € 41, you can travel outside of 6.30 - 9.00am, Monday through to Friday (and anytime on weekends). Just like the peak ticket, the off-peak One Day Travel Ticket is valid for a whole calendar day. You can choose for an all-day ticket including peak hours (€ 61) and an off-peak hour ticket (€ 41).